If you're looking to order a beautiful flower bouquet, enter coupon code 'blog' at check-out to save 15% off your entire order! My favorite color is also purple and I just love the looks of this boquet and bet it smells wonderful. 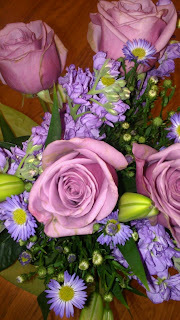 Your flowers are so beautiful.I can see why you like purple as your favorite color! I would like to get Pink roses with red roses and white roses because they look so pretty together! Roses is my favorite flower!